The answer to all your sewing emergencies, our personalised Sewing Kits are compact and come complete with needles, thread, scissors and even spare buttons. 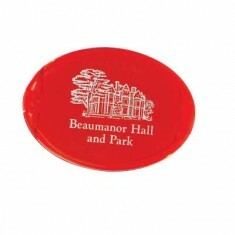 As they are so practical, they make an excellent promotional give away and will always be received with thanks. 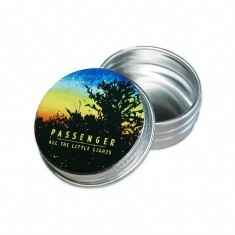 Whether you need to reattach a button or sew up that small snag, customised sewing kits are incredibly useful. All our custom printed sewing kits are small enough to pop into your bag or suitcase so that you always have it with you for any business trips away or at hand for when your button decides to fly off. Our promotional sewing kits are ideal for kitting out your hotel rooms to help any guests or handing out at your next event. Due to these kits being incredibly useful, your branding will be around for years to come for when your clients have those accidental rips. An absolute travel essential, our custom printed Travel Sewing Set Le Harve comes with everything you will need to fix any outfit breakages. 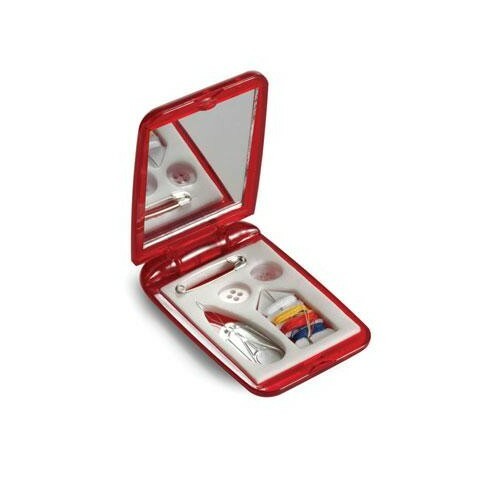 Packed with scissors, needles, safety pins, thread, needle threader and even spare buttons, this kit is ideal for taking away on holiday or popping into the beside draw at your hotel. This credit card size pack comes printed to the cover and, if you want to provide some extra help for anyone who is prone to outfit mishaps, these kits are perfect for handing out at events. Whichever your favourite sewing kit may be, use our quote basket to get a price today. Oval Sewing Kit with mirror and hinged lid. Printed one colour, one position. 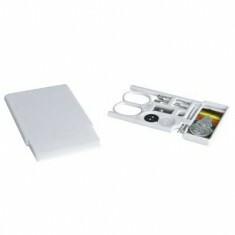 Everything you need in one handy kit, mirror, safety pin, buttons, threader, c..
Credit card sized. 6 piece set. Outstanding print area & extremely practical.